Labeled-"The Original Mary Jemison Cabin, Which Stood on the Gardeau Flats, Castile, NY"
Actually Log Cabin of the Everett Family early settlers of the Park area. This image shows how careful you must be when exploring the past. It shows what is claimed to be Mary Jemison's Cabin on the Gardeau Reservation. The postcard is part of an undated folder published for "The Glen Iris Products Co, Castile NY. The folder is probably from the 1930's or 40's, but the image may be from the turn of the century or earlier. The cabin is, according to the information below, actually the log cabin of a pioneer family who settled in the Park area in the early 1800's. 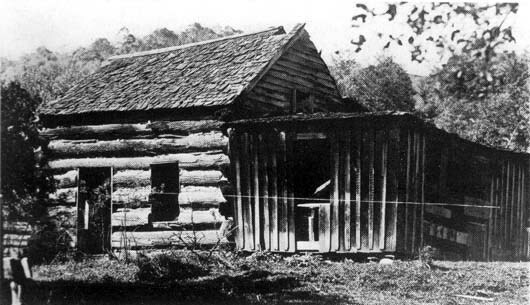 "that photo is one of several of the Everett log cabin, and again and again identified as the Jemison cabin. Edalyn Everett's mother and father both identified it as did Marian Piper Willey and Mrs. Anderson of Castile. Mrs Everett told me that it was located just a bit north of the Castile entrance to the park and its ruins were altered or possibly removed when the park road was extended north. Cal DeGolyer remembered a cabin close to the gorge edge near the lookover at the bottom of Snake Hill; I do not believe these were the same cabins. Mrs. Everett described the log cabin thoroughly, and how sad the family was when the state took their property there with the orchards, so there is no question in my mind that this was the Everett cabin, as well they had photos of it. Likewise, the cabin in the photo does not align with the detailed descriptions of Mary Jemison's cabin and according to Mr, Letchworth's research, Mary jemison's cabin was demolished to build the Federal style house Gould house on Gardeau after her departure, well before the time of photography." Click here to see a general view of Gardeau in the 1870's. For more information, see Glimpse of Mary Jemison and the Pioneer era of the Park.